20 juices, 10 protein shakes, 5 soups, 5 days later and you’re left feeling lighter, higher energy, your skin is clearer and you feel amazing. That’s the feeling of a Chef V 5 day cleanse. A delicious and healthy fully organic cleanse that can help you lose weight quickly, clear up your skin, detox your whole body and improve your focus and concentration. And you know what? It tastes pretty darn good too! In this review of the Chef V cleanse I want to take you through some of the things I like, some of the things I don’t like and really everything you need to know before you commit to your purchase. Ready? Let’s get stuck in. I really like that you get protein shakes with this cleanse, because a lot of cleanses can be really lacking in protein which can leave you feeling a little low energy. And if you’re not getting protein you have to take it a bit easier in terms of physical exertion. With the Chef V however you get two protein shakes a day and they’re made with brown rice and hemp protein so they’re still vegan friendly and completely organic. I also really liked that you get to have a nice warm soup every night, only drinking juice is great but you do start to miss having hot meals, especially if you’re doing the 7-day cleanse. And it’s low sugar, there is a little apple to help sweeten up the green juice but not so much that it becomes unhealthy again. Every day you’ll get about 30g of sugar which is a lot less than you’d normally be eating. Besides, what sugar there is naturally occurring from fruits which is much better for you than refined sugar which has been stripped of all its nutritional value. You also get sent a pre-cleanse guide upon purchase which tells you how to get ready, it’s a list of foods that you can and can’t eat, so it tells you to avoid stuff like dairy and soy products and stick to non dairy milk, lentils and lots of other helpful advice like that. What I don’t like is that it doesn’t come frozen, so once it arrives you have 7 days to finish it otherwise you have to throw it out. 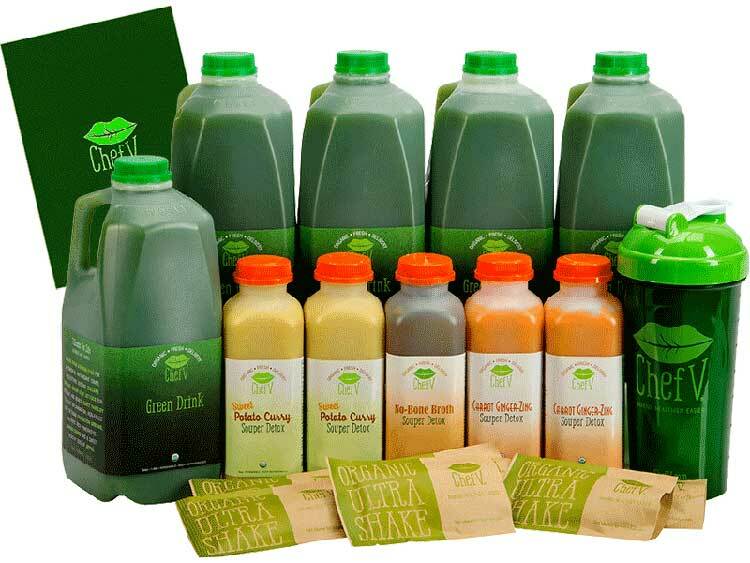 Compare that to the Raw Generation Skinny Cleanse for instance(https://www.juicebuff.com/raw-generation-skinny-cleanse-review/) which is flash frozen and lasts for 6 months in the freezer this can be a pain if something comes up mid cleanse and you have to stop. Apart from that I’m impressed, it’s harder to find a completely organic cleanse and Chef V have done a good job with theirs. It varies from person to person of course and depends on lots of things like body chemistry, lifestyle before, lifestyle after, but I’ve heard of people losing up to 25 lbs on the 7 day cleanse! But I took a deep dive into all the customer reviews to get a better idea of how much people were actually losing and it looks surprisingly good. On the 3-day cleanse people are losing anywhere between 4 and 8 lbs, on the 5-day cleanse people are losing 5 – 10 lbs and on the 7-day cleanse it’s anywhere from 10 lbs up to 20 lbs or weight being lost. I think the 25 lbs is a special case but it can’t be denied that a lot of people are losing weight and quickly during the Chef V juice cleanse. Apart from the weight loss there are loads of reports of people acne finally going away, skin feeling brighter and younger and the energy levels! You feel awake, you feel alert, you lose that sluggish feeling that sometimes comes mid-morning from a carb-heavy breakfast and you stay clear-headed all day long. I won’t rave too much though, I’ll leave it as a surprise for when you try it yourself. So what’s actually in this mysterious green drink? I’ll tell you, it’s a combination of black kale, green kale, collard greens, green leaf lettuce, curly parsley, green chard, dandelion greens, apple, apple juice and filtered water. Basically it’s all the really good green vegetables that give you lots of nutrition and vitamins and help detox your system so you get the bad stuff out and replace it with all the goodness of fruits and vegetables. The taste isn’t bad either, the apple and apple juice help give it some sweetness and the water takes the edge away so it’s very smooth to drink. It takes some getting used to if you normally drink sodas but it is worth pushing through for because you get used to it quickly and it’s very good for you. You also get 2 protein shakes, a chocolate and a cinnamon flavour, both are nice, sweet but low on sugar because it’s made with stevia rather than sugar and both totally vegan. And each one gives you a little under 20g of protein so it gives you a really nice boost. Finally you have the soup, there’s a ginger carrot soup and a sweet potato soup, again organic and vegan plus gluten-free and really tasty. A nice way to end the day as well, because who doesn’t love soup? A really great juice cleanse if you’re looking to lose weight and want to do it drinking completely organic juice. The soup and protein shakes also make it a good choice for more active individuals. I’d start with the 3-day cleanse if it’s your first ever juice cleanse, the 5-day if you’ve done one or two before and the 7-day if you want a challenge and want to lose a lot of weight. My Name is Mia Young and I run Juice Buff, your go-to place for juicing info. I work hard to bring you all the best reviews and info about everything to do with juicing, juicers and blenders.